The City of Albertville is located in Marshall County in the Northeast part of the State of Alabama. Albertville boasts a population of 21,160 and is named for Thomas A. Albert, one of the first area residents. It is situated on Sand Mountain, a plateau of approximately 26 square miles. Albertville is home to a world-class school system with superb academic standards. The system has undergone a renovation program that resulted in new facilities throughout the Albertville High School campus to include a Fine Arts Center with events throughout the year. Albertville is also home to the Alabama Aviation College that is located at the Albertville Regional Airport, which contributes greatly to the economic growth and stability of the City. In addition, Albertville has access to quality health care through the Marshall Medical Centers and is within commuting distance to three community colleges and three universities in North Alabama. Albertville is home to the Mueller Company, which produces fire hydrants. For this reason, Albertville is considered the "Fire Hydrant Capital of the World." To commemorate the one millionth fire hydrant, a chrome fire hydrant was placed outside the Albertville Chamber of Commerce. Albertville is also home to many popular poultry plants operated by Wayne Farms, Pilgrim’s Pride and Tyson Foods. Mitchell Grocery Corporation, located in Albertville, is a wholesale grocery distribution center serving more than 200 independent supermarkets in the Southeast. According to the Alabama Transportation Director’s recent report, there were 674 crashes in Albertville in 2012. Of these accidents, 243 resulted in non-fatal injuries and no fatalities. These statistics highlight the fact that the residents of the City of Albertville are busy traveling throughout the area and like everyone else, they are not immune from car accidents and injuries. 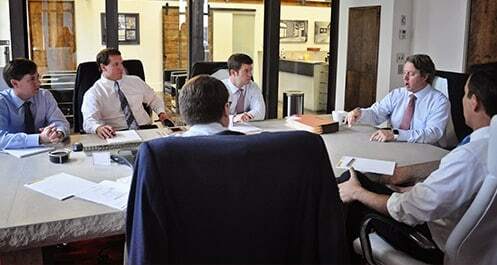 Centrally located in Birmingham, the attorneys at Hollis, Wright, Clay & Vail, P.C. routinely represent individuals and families that were injured or victimized by an automobile accident in the Albertville and the Marshall County area. Our attorneys frequently appear in the Circuit Courts of Marshall County, Albertville and Guntersville Divisions. Our Albertville car accident attorneys will devote the time, energy and resources to obtain the compensation that you and your family deserve as a result of the injuries and losses sustained in a motor vehicle accident. If you or a family member is hurt or killed in a car wreck in Albertville that was caused by another, then the laws in the State of Alabama allow you to be compensated and claim damages including medical bills, lost wages, pain and suffering and emotional distress. If you were permanently injured or scarred, then you can claim compensation for that element of damage as well. In order to maximize your chances of a good recovery from the insurance company for the at-fault driver, it is imperative that you take the necessary steps immediately following an accident to protect your rights. After obtaining medical treatment for your injuries, the first step in the process should be to locate and hire a good, competent attorney that specializes in handling these types of cases. You should not settle for just any attorney. Rather, you should research the attorneys in your area and hire one that has the experience and resources to help you in your time of need. You should look for an attorney that routinely appears in court and tries automobile accident cases and will be a strong advocate for you. The attorneys at Hollis Wright have years of experience and a proven record of success in handling motor vehicle accident cases. Our attorneys evaluate each and every car wreck case with a tremendous amount of care and concern in an effort to identify and pursue compensation for each and every aspect of the injuries you or a loved one sustained in an accident. If you have been injured in an accident that occurred in Albertville, Alabama, please contact us now at 1-844-529-8255 for a free and confidential consultation. If you hire our firm, we will handle your case on a contingency fee agreement which means that we don’t get paid unless we successfully recover money for you.